The soils in the air that actually cause the filtration lines can be a host of different soils, but are most commonly cooking oils, soot from burning candles, poorly ventilated fireplaces, fine sand & clay particles, and many other indoor air pollutants. Although routine vacuuming will help slow the build up, these microscopic particles are so fine they easily bond to and penetrate carpet fibers making them difficult to remove even for professional carpet cleaners. Can the black edges be removed? 1. Application of specialized cleaning agent to break up and loosen the fine particulate soils. 2. 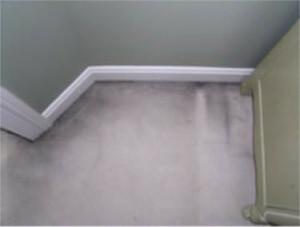 Hand scrubbing edges to agitate carpet fibers, create a light foam, and suspend soils. 3. Extraction of cleaning agent with detail tool to remove suspended soil. 4. Rinse and extraction to thoroughly flush and remove soil and cleaning agents. 5. Application of an anti-resoiling agent to help prevent future soiling of carpet.